I wanted to do this post in an attempt to provoke thought for myself and others who may read it. You see I have recently thought how I want to be remembered by my kids. It may sound selfish and arrogant but it doesn’t really matter to me what other people think of me. The most important thing I can do is be true to my beliefs, try to grow and leave an imprint on my children, and ultimately their children and their children. Why am I thinking of this now? Because this is part of lifes journey. It doesn’t happen overnight and is always a work in progress. So I wrote a list of items on “my legacy” paper that I certainly don’t want to pursue or leave as an imprint. Those are all crossed out. The others are a sample of what I want to be and what I already am. That may sound confusing, but what that means is, is that we are already what we want to be, we just need to let it shine through. We just have to let our ego and mind get out the way so our true essence shines. For me it is not important how much money I make, the job that I have, the image that I carry, my house address, what others think of me, how much talent I have in a particular field or whatever the false need is. I would rather be remembered as someone with compassion, who is kind, generous, patient, just being myself and more. If you look at the 2 lists, you know what strikes me the most? The items of my list are FREE and can be done right now. Tell me what I need to have money for to be any of those things? Charitable? No. I can give love, a smile, a kind word or a helping hand at any time with no cost. The other striking thing for me. Is that it involves a simple choice. YOU HAVE A CHOICE. Your own free will will allow you to live the way you want to. The important thing to realize is that you are not doing this for an image or what others think of you. It is about leaving an imprint on my children, so they can spread patience, kindness, love compassion etc. That is my goal. No matter how you have behaved or believed in the past is irrelevant. You have a choice and you have the power. The Power is in this moment and that is the beauty of this all. This doesn’t happen over night, but that is OK. Life is a journey and you keep doing the best you can to progress. Anita Moorjani’s book – Dying to Be Me, is a story of a women who was dying in hospital of cancer, with all her organs failing and shutting down she had a near death experience. Her message when she came back was very simple. Live FEARLESSLY and BE YOURSELF. That is it. From having her organs shut down and flat lining to walking out of hospital a couple of weeks later free of cancer, she now lives her life according to those 2 principles. I’m going to say this again … you are SUCH a messenger. Thank you for this post, Kenneth. And you are so KIND. Thanks. Knowing what we DON’T want to be remembered by is useful, but limiting ourselves to only using negative descriptors can lend too much energy to the very thing we are trying to stay away from; learning how to identify where we’re headed (or where we’re at today) by voicing positive phrasing helps emphasize and strengthen our ability to keep moving in that direction. Your list clearly shows you’ve figured this step out already, in that you’ve used positive and powerful descriptors to identify desirable legacy traits. Thanks for this excellent reminder that it’s never too late to impact how we will be remembered. On my list, I might add one more, which has particular significance for me: accountable. When penning my own list, I’d have to leave room for that one. For sure. Thanks. I appreciate your comments and you sharing personal insight. What an important reminder to us all. I agree wholeheartedly that we should strive to live our best. You are teaching your kids the most valuable lesson this way. Thanks for the reminder. I really thought this was an excellent reminder to us all. Kenneth Todd shares from his heart. Its a gentle reminder that we are what our children mirror. It is very important what we are teaching and not teaching them…. Enjoy this post! Thanks for this post, Ken. I pray for many fathers to have this vision for themselves, for their families, for their children’s future. It doesn’t sound arrogant at all, it sounds moved and directed and controlled by an unselfish love. Your children are blessed. And I’m adding that book to my reading list. Thanks Amy. You will enjoy her book. It is written nice and simply too, which I found easy to read and compelling. Wonderful Kenneth and sharing on facebook..
As you all know, I follow several other blogs and just wanted to share this particular post with all of you. I find it very powerful. I’ll post my photo of the day later. 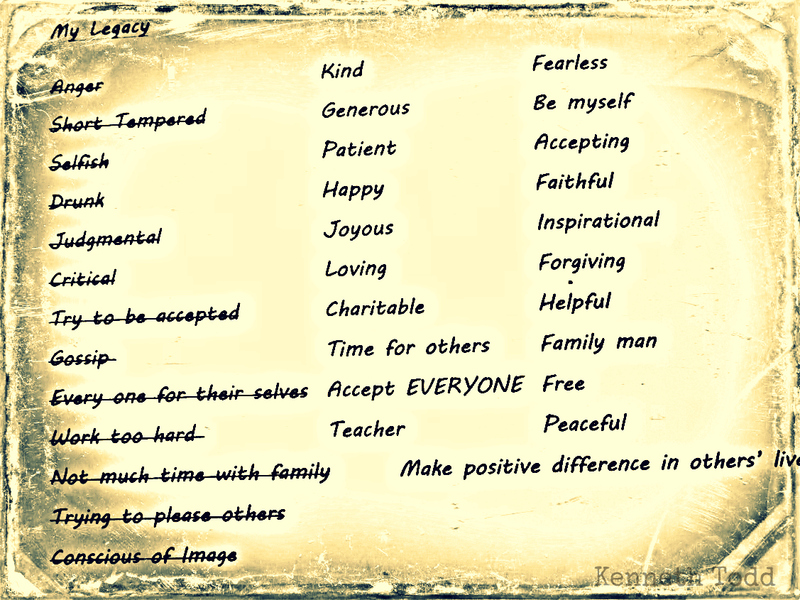 Fantastic post Kenneth…thanks for sharing this with all of us!